Cut 8 slices of bread. Brush one side with olive oil. Spread Apple Cranberry Chutney onto the opposite side of four slices. Layer with turkey, Havarti slices, and arugula. Top with other slice of bread (olive oil side out). 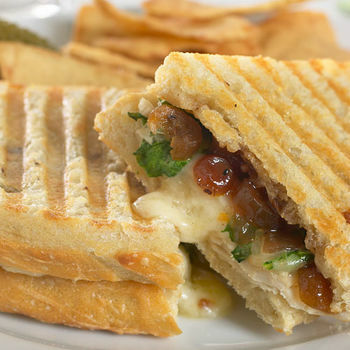 Heat in a panini press or grill pan until crust is golden brown and the cheese is melted. Enjoy! A delicious way to enjoy turkey leftovers.